Mission Control is a powerful and handy new feature that provides you with a comprehensive look at what’s running on your Mac. It gives you a bird’s-eye view of everything — including Dashboard and full-screen apps — all in one place. 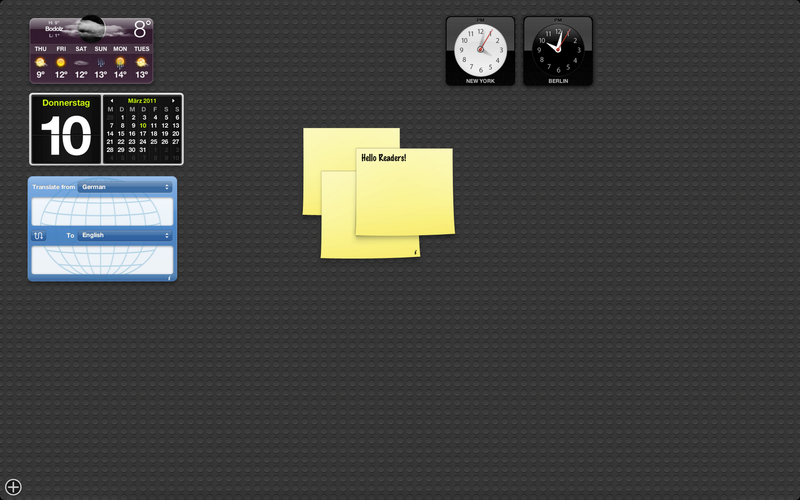 With a simple swipe, your desktop zooms out to Mission Control. 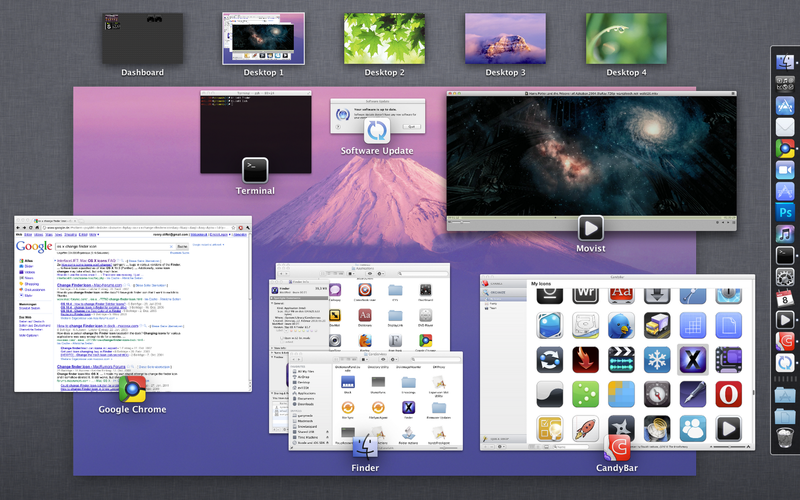 There you can see your open windows grouped by app, thumbnails of your full-screen apps, and Dashboard, arranged in a unified view. And you can get to anything you see in Mission Control with just one click. Mission Control replaces Exposé and combines Spaces hot corners and Exposé to a unified experience. 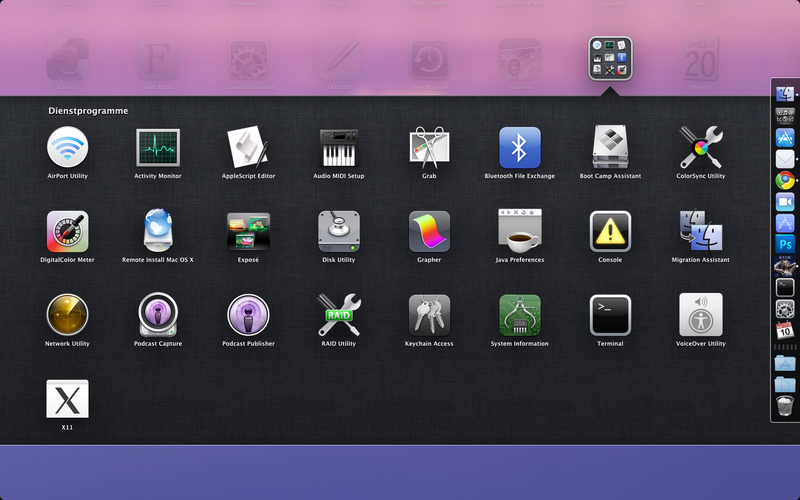 Launchpad gives you instant access to your apps — iPad style. 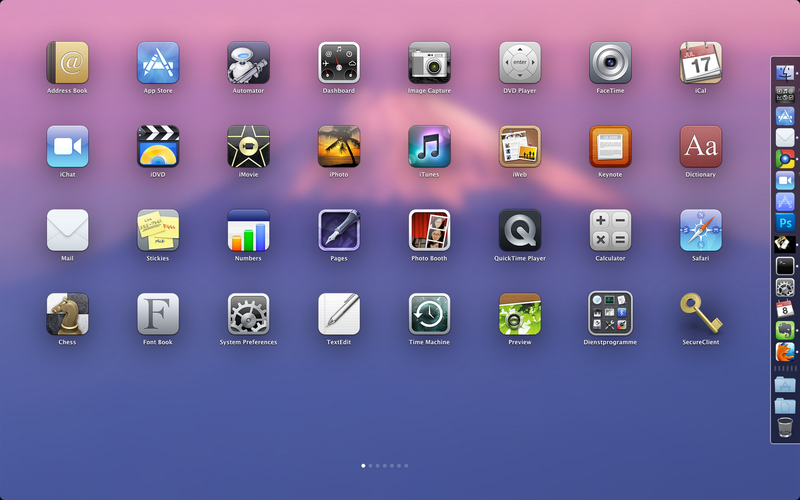 Just click the Launchpad icon in your Dock or use a "hot corner". 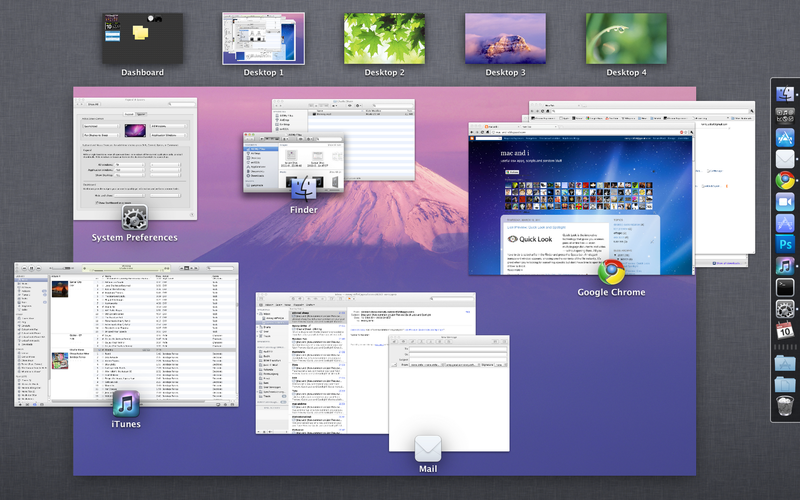 Your open windows fade away, replaced by an elegant, full-screen display of all the apps on your Mac. It takes just a swipe to see multiple pages of apps, and you can arrange them any way you like by dragging icons to different locations or by grouping apps in folders just as on iOS. Spaces enables users to create multiple virtual desktops suited to the unique needs or work habits of the user. 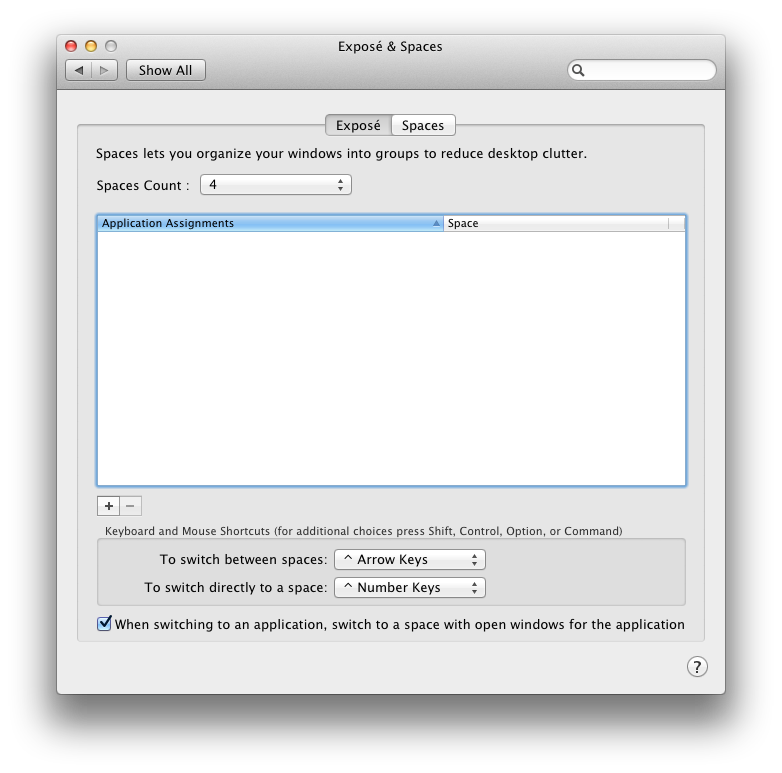 A user could, for example, create and assign a "space" to office work—enabling them to leave a work-related application (such as a Word processor or a Spreadsheet) running full-screen—and then switch to a different space designated for browsing the Internet, or navigating file structure in Finder windows. Up to 16 spaces can be created, and applications can be bound to specific spaces. There are various ways to navigate between spaces, including user-configured function-key combinations, via Mission Control, or by dragging windows and applications—in the direction of the desired space—to the corresponding edge of the screen, and holding for a moment until the space switches. A little word to "hot corners" as you see you can trigger Mission Control (All Windows), Dashboard, Launchpad and much more via hot corners. 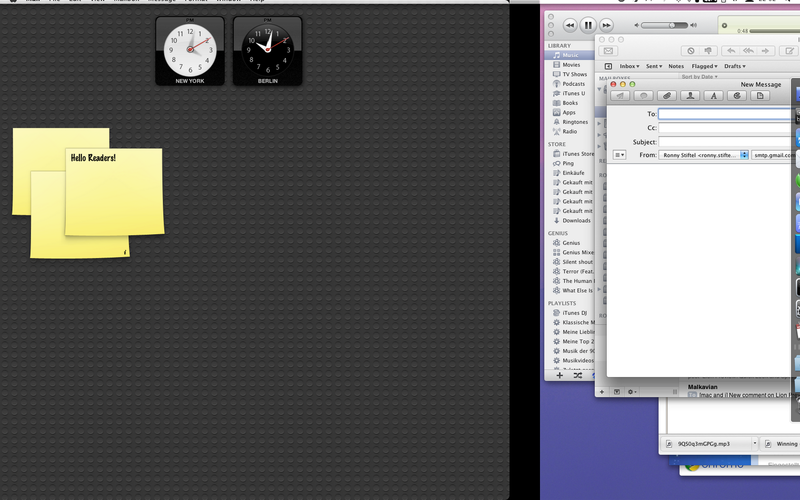 If i move my mouse to the upper right corner, for example, i get the Mission Control View. If i move it to the upper left Launchpad starts. 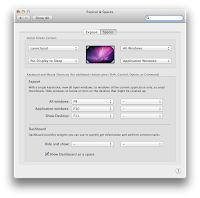 This is a very convient way to use those features besides the Shortcuts, Dock Icons or gestures. Dashboard is home to widgets: mini-applications that let you perform common tasks and provide you with fast access to information. With a single click, Dashboard appears, complete with widgets that bring you a world of information — real-time weather, stock tickers, flight information, and more — instantly. Dashboard disappears just as easily, so you can get back to what you were doing. 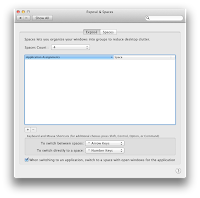 In Lion Dashboard can also be handled like a Space meaning it appears in Mission Control and you can navigate to it trough desktop swipes. Do you have to say "engage" or "make it so" when you flick on 'Mission Control'? Wow voice control like that would be great but seriously excellent stuff as usual on this system. Cool stuff, maybe Macs aren't that bad after all. I frequently notice my comp running slow, only to realize I still have a CPU-hog running in the background. Interesting stuff, I didn't know they were that versatile. The launchpad feature looks like a really good idea. In my very limited use of OS X I've always thought that trying to cram all of my useful applications in the dock was sloppy at best. Looking forward to Mission Control, i see they've changed the interface of Dashboard too. Why does the title makes me feel like I can fly with this computer? Wow, Macs can be run pretty tight, I did not know this! It would be good to have that much control over both the GUI and it's functionality. More posts like this and I'm gonna start saving for a mac. Great review! Makes me kinda want that. Nice, I really like Exposé so I'm sure MC will be awesome. This looks great for productivity, I like being able to see all my projects sprawled out like that.